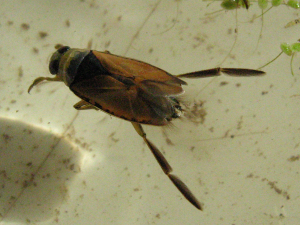 Common backswimmer (great waterboatman?). One of several caught during a pond dipping event. After some time, they all started popping up out of the water and raising their wings, as in the picture. We wondered if they were contemplating flying off, or renewing the air supply under their wings.